Banana leaves need to be heated briefly to soften them and make them flexible enough to fold without breaking. This can be done by pressing them on a heated griddle, passing them gently over a flame, or, as I do, tossing them in a hot oven briefly! Grind the soaked rice to a smooth paste with a little water. •Combine the ground rice with the jaggery, jackfruit pulp, coconut, salt, and baking soda if you’re using it. Mix thoroughly. You should have a soft, moist batter that is thick enough to spoon into the banana leaves without being too runny. 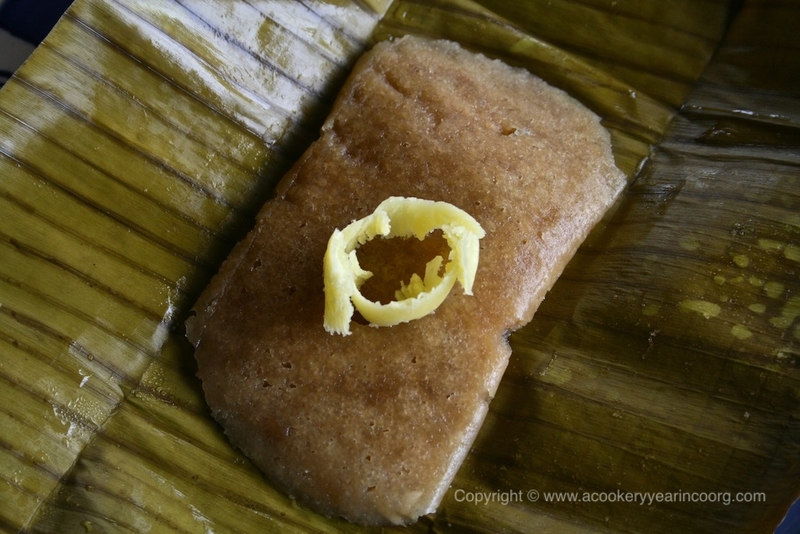 •Place two tablespoons of the batter in the centre of a banana leaf wrapper and fold gently into a rectangular parcel. Have your sekala ready with water at a simmer and layer the parcels in as you prepare them. When they’re all done, cover and steam on medium-high for about 30 minutes. •Remove the lid of the steamer and allow them to cool a little before tucking in. Kulae puttu tastes wonderful with a dab of fresh butter or ghee. Day old kulae puttu tastes delicious seared in a little ghee and dished up for breakfast or as a teatime treat.